On Tuesday 13th January at 7:30 pm at St. Andrews, I uttered the fateful words “There will be no snow, I have banned it”. At 7:31 pm, it began to snow! On Wednesday 14th it snowed. We decided to go ahead with the celebration, and after anxious phone calls from various people, we prepared to receive our guests. The weather might have been inclement, but the warmth of fun in the church was wonderful. Everyone was having a great time. After a vast quantity of tea/coffee and cakes, buns, etc, we settled down to a game of Musical Bingo. A visitor commented: “How can they guess the tunes, when they are all singing the songs?” Well, that is part of the magic. 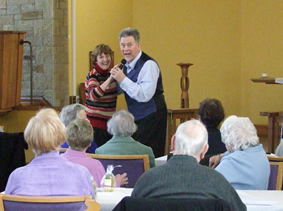 After a delightful lunch we were entertained by Ken Romano, who spoiled everyone, with songs and dancing. All through the day the guests were pampered by the Red Cross, having a relaxing hand, arm and neck massage. We finished the day with a short communion service, led by Rev Andrew and then went on our way. I wish to thank EVERYONE who helped, in any way, to make this day such a success. Without their dedication, the day would not have happened. Please note that Holiday at Home 2015 will take place on the 6th, 7th and 8th July at St. Andrew’s. Mark this in your diaries. 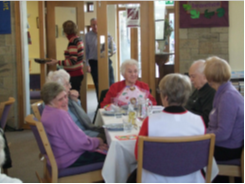 Holiday at Home is open to anyone who is housebound or does not go on regular holidays. If you would like more information, please contact me. Details will be announced shortly, but be assured - it will be 3 wonderful days of fun and companionship. Crag Road Drop-In - Urgent appeal for help!